Spray on safety at night. This reflective spray is activated when the light hits it, reflecting light back to the source and making sure you’re visible. This rugged, permanent formula dries a matte gray and can last up to three months, defying wind, rain, and UV rays. It’s a life-saver that works like magic. I sprayed the heels of my Boy Scouts before a night hike. Product is worth the money. Easy ordering and delivered on time. I bought this for my daughter on her evening biking and jogging runs. Am extremely happy with this product, plan on buying more. Used on my Mototcycle jacket and can be seen from a distance at night. 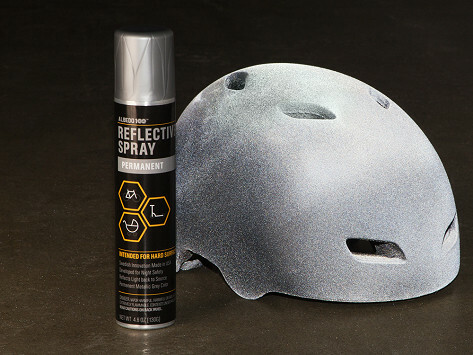 This not-far-from-magic reflective spray transforms clothing, helmets—even bikes—into a reflective surface to keep you safe at night. Albedo100 is Made in the USA and activated when the light hits it. 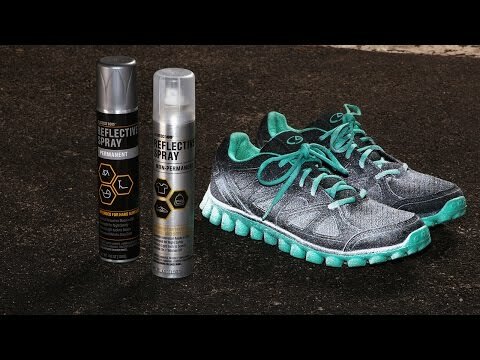 Spray it on hard surfaces (think: bikes, outdoor equipment, wood, and metal) or the textile of jackets and backpacks for high visibility in the dark. The non-permanent formula is invisible on your clothes and will last a week or so, while the permanent one dries a matte gray and reflects for up to three months, defying wind, rain, and UV rays. We had some our bikers here at The Grommet try it out. They appreciated the day-time invisibility. You don’t have to carry extra reflection gear—it’s a lightweight and nimble solution. Now you can stay safe and transition seamlessly from day to night.